INDEPENDENT TREASURY AND LIBERTY. MARTIN VAN BUREN. 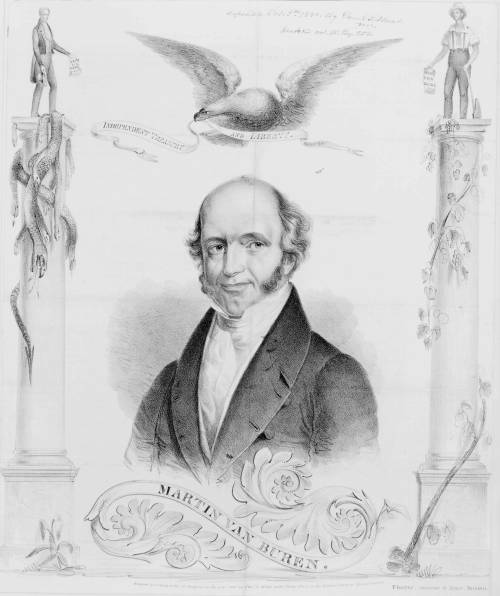 One of the few campaign prints issued in support of Democratic incumbent Martin Van Buren's 1840 presidential bid. Designed to appeal to the workingman, the print invokes the recent history of Democratic support of labor interests. The artist specifically cites Andrew Jackson's defeat of the United States Bank and Van Buren's recent executive order reducing the work day of all federal employees to ten hours. In the center is a large bust portrait of Van Buren. Above it flies an eagle holding a streamer with the words "Independent Treasury and Liberty." Van Buren's Independent Treasury Bill, passed in July 1840, established an independent treasury in Washington and subtreasuries in cities throughout the country, which took the place of the late Bank of the United States. The column on the right is entwined with a large grapevine. On its capital stands a farmer, holding a large axe and a document "Ten Hours."